Two cast metal uprights, height 18 cm, fitted with two nickel platedrods supporting expansionbar of length 38 cm. Expansion bar isfixed to one upright and moves a pointer on the other, when heated.With scale reading0 to 90Â°, supplied with one each aluminium, .brass and ironexpansion bars. Comprising two cast-iron uprights, height 18 cm. 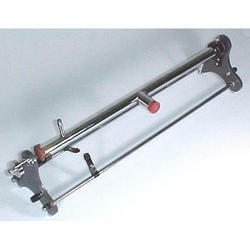 linked by two nickel plated rods supporting on expansion bar, length 38 cm. fixed to one upright and resting on a friction pointer placed at the other. With scale reading 0 to 90 deg. With one each aluminum, brass and iron expansion bars. We are offering Basic Linear Expansion Apparatus. Available at market leading price, our products are in huge demands among clients across the globe. 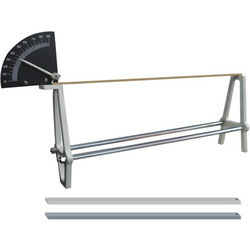 - NSAW LINEAR EXPANSION (VERTICAL) Consist of a chrome plated brass pipe fitted on a superior quality spherometer. - Inlet & Outlet steam tubes. - Complete with 3 test rod.